A few months ago, I noticed the new trend of adult coloring books. Initially I was excited. An activity to eliminate tension and de-stress…where do I sign up? I tried to embrace them, but then quickly realized they were actually making me more stressed, and a little jealous. 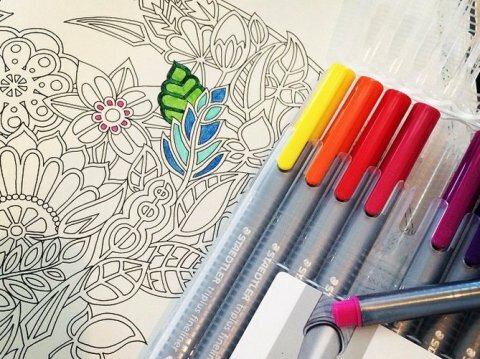 In case you don’t know about adult coloring books, it’s a thing. No, really. (There are even Jewish ones.) 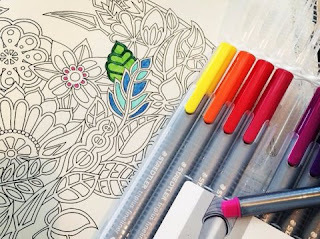 Adult coloring books are the Candy Crush of 2015. It is a new way to enjoy/spend/waste/squander your free time, depending on where you fall on the whole craze. I am at odds with the concept. On the one hand, I am all for it. I think coloring is therapeutic and calming—an escape from all our mishegas. Plus it allows those of us who lack full artistic skills to feel like we have the ability to create beautiful art, even if we just added some color here and there. On the other hand, I don’t see when I will make the time to purchase one of these coloring books, let alone color it in. Coloring is one more thing to add to my ambitious list of things I would like to get around to, but probably never will due to the length and scope of my list of things I need to actually do. You know, like eating, sleeping, and playing with my kids. Maybe even showering. What is most troubling to me is that my overwhelming feeling towards the books, or more specifically the people who do have the time to color in them, is jealousy. How have I managed to take this innocent hobby, one which is suggested to relieve tension, and use it to fuel my own anxiety? Adult coloring books have become the source of my self-inflicted schpilkes. Oy. Escapism is a great thing. We all need some free time to escape our day-to-day routine. It helps keep us both interesting and interested. Thankfully there is a method of decompression out there for everyone: reading, cooking, cleaning, internet surfing, trolling, good TV, bad TV, crossword puzzles, naps, and yes, adult coloring books. I don’t begrudge anyone doing any of those things… anyone, but me of course. Coloring is something I would have to commit to. Not in the sense that I would be dedicating myself to coloring, but in the sense that I would decidedly NOT be doing all the other things on my list. The laundry pile will sit there unfolded. The DVR will continue to accumulate new shows. The photo albums will remain unassembled. The closets will wait a little while longer to be sorted and purged. This latest craze has indeed made me crazy, seething with desire for the time to color. Yet I have simultaneously deemed coloring an unacceptable use of my free time until I finish the never-ending list. I am jealous of the people who are coloring. And I am no closer to completing my list, so now I am angry, too. Angry, distracted, overwhelmed, totally farmisht: I am exactly the kind of person that could benefit from coloring. I want to color. But mostly I want the presence of mind to accept the fact that I am not coloring and to not be jealous of all the people who are. One more thing to add to my list.